Good, Clean, Dirty Fun... For The Whole Family! Operating since 1952, Rose Creek Mine is one of 3 state licensed gem mines in Macon County, North Carolina. Centrally located in Franklin North Carolina in the heart of the Smoky Mountains! The Rose Creek Mine is near waterfalls, white-water rafting, Appalachian Trail hiking, museums, antique shops, historic train rides and the Cherokee Indian Reservation. Rose Creek Mine is one of three state licensed gem mines in Macon County. Here you can find rubies, sapphires, garnets, amethysts, citrine, moonstone, topaz, smoky quartz, rose quartz, and quartz crystals. All equipment is provided and they help beginners. You dig your own dirt in the mining tunnel and wash the dirt away in the covered flume out of direct sunlight or rain! Mine for Gems rain or shine. 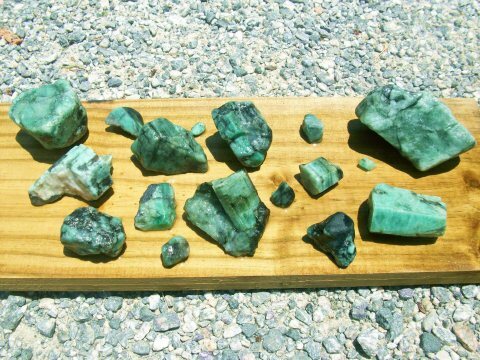 Gem Mining is a great field trip for church groups, scout troops, senior citizen groups and others. 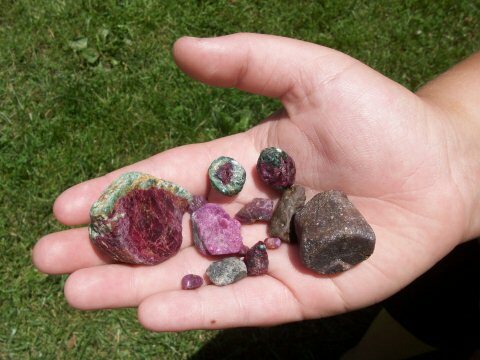 Rose Creek Gem Mine has an educational program that will fit your needs. Scouts can work on their geology achievements and badges. But you will for sure laden yourself with some precious stones from this rich mine in Franklin NC. Rose Creek Gem Mine a total family experience that will enrich your family with relational gems as well as rubies, sapphires and such! Don't miss this when you visit our amazing town of Franklin NC! You dig your own bucket of dirt in the mining tunnel. Make sure you visit our Rock & Gift Shop before you go! There are lots of interesting specimens to round out your collection. We also carry lapidary supplies. All major credit cards accepted. Cash works well too! Can't come see us? Have a treasure hunt at home! Visit our Mail Order Page and see all the exciting things you can purchase. It's fun for the whole family. Enter the ONLINE store by clicking on the Amethyst! You will have a great time at the Rose Creek Mine. The Starrett Family, Tom, Linda, Sam & Jacob will make sure that you have the most enjoyable time possible here in the Smokey Mountains while mining at their Rose Creek Mine! This was my first time mining and i LOVED it ! The atmosphere was very family oriented. Even though we did a salted bucket it was the search of finding that pretty gem. We dug a few buckets ourselves and that was great getting dirty to find a treasure. We felt like two kids playing in the dirt. Being in the mountains mining as a woman you worry about restrooms and they were clean and even had a place to wash your shoes off. The best part is we forgot to get buckets to go for our children and they reopened and sold them to us with no questions and sat, talked and even gave us history about the mines. WONDERFUL job we will be back!!!!!!!!!!!!!!!!!!! At Rose Creek Mine they offer group packages for schools, rock clubs, scouting groups, senior citizen groups, church groups, youth groups, day care centers and any other educational or social groups you can imagine. There is plenty of parking and a covered picnic pavilion free for your use. Scout Troops: Work toward your badge, belt and achievement awards. We were looking to purchase a home in western North Carolina and came across a listing on the internet posted by John Becker. We looked in various places but decided on purchasing the home in Franklin that was listed by John. We were extremely pleased with our dealings with John. He is very professional, knowledgeable and he went over and beyond what most realtors would do. We highly recommend John.